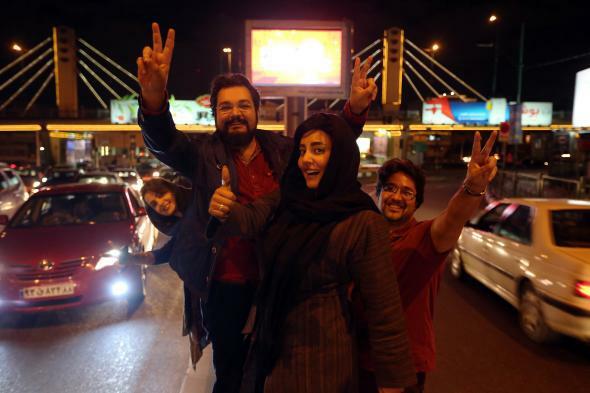 People celebrate on Valiasr street in northern Tehran on April 2, 2015, after the announcement of a framework nuclear agreement. With the deadline for a deal over Iran’s nuclear program getting extended until July 7 today, a new poll shows that the Iranian public is broadly supportive of a deal, but also highlights just how difficult it may be to overcome the sticking points that remain. The poll, conducted jointly by the University of Maryland, University of Tehran Center for Public Opinion Research, and the Toronto-based IranPoll.com, surveyed more than 1,000 Iranians in May and found that 57.4 percent of Iranians support a deal including restrictions on uranium enrichment and international inspections in return for sanctions relief, with 14.7 percent opposed. That puts them essentially in agreement with Americans, 59 percent of whom support a deal in principle. However, a plurality of Iranians (37.5 percent) also believe, as their government has maintained since a framework agreement was struck in April, that the P5+1 has agreed to lift sanctions on Iran immediately. More than 62 percent believe that all U.S. sanctions on Iran will eventually be lifted. The Obama administration has maintained that sanctions will be lifted gradually as Iran complies with the terms of agreement and that non–nuclear-related sanctions, such as those related to the Iranian government’s human rights practices and support for terrorism, will remain in place. The pace of sanctions relief has been the main remaining obstacle to a deal since April, and at that time it looked like the negotiators were simply punting the issue down the road. But over time, the positions of both sides on the issue have hardened to the point that publics in the two countries have very different ideas of what the final agreement will entail. Consequently, it’s hard to see how the negotiators will reach an accord that will allow them both to maintain credibility. There’s good news in the survey for President Hassan Rouhani ahead of legislative elections next year, with voters mostly giving him positive marks. Twenty-four percent of voters also say they’d like to see him re-elected in 2017 over a long list of potential rivals, with former President Mahmoud Ahmadinejad coming in a distant second with 8.8 percent. A large majority of Iranians support continued nuclear research but oppose nuclear weapons, saying that their country’s program is necessary for medical research and economic development. The survey shows that while a small majority of Iranians have a positive few of the American people, they overwhelmingly (73.4 percent) have a very unfavorable view of the U.S. government. They also believe that U.S. leaders don’t actually think Iran has nuclear weapons and is imposing sanctions as a way to limit Iran’s growing political power, and are divided on whether the U.S. would actually comply with the terms of the deal if it were reached. While Rouhani has staked a good deal of his political capital on reaching a deal, nearly 75 percent of voters say they would mostly or completely blame the P5+1 rather than Iran if negotiations fell apart. This could be another bad sign for the talks: Rather than try to sell the public on a deal that looks very different from what they’ve been describing for the last few months, Rouhani and his negotiating team may conclude it’s politically more advantageous to pull out of the negotiations and blame the American for their failure, contributing one more to the litany of sources of mistrust between the two countries.